ColonialWebb is one of the largest commercial, mechanical, and electrical contractors in the region, specializing in Construction, Service, Industrial Refrigeration, and Manufacturing. We provide service to customers ranging from small businesses to Fortune 500 companies. Headquartered in Richmond, VA, with offices located in Hampton Roads, DC, Charlottesville, and Maryland, we build, service or retrofit systems for virtually any type of building – from schools and museums to high-rise office buildings and hospitals – even industrial plants that manufacture everything from potato chips to computer chips. Our parent company, Comfort Systems USA, provides a nationwide reach through 36 subsidiary companies. And since we are a part of Comfort Systems USA, this gives us distinct advantages over our individual local competitors. Sharing best practices, ideas and technology gives you the best project quality and performance. Whether your project is Design-Build or Plan and Spec, we can help you from the design phase to construction with qualified professionals, quality products and an experienced contractor team. Delivering high levels of quality, performance management, and customer satisfaction, our Building Service team will maintain, repair, or replace your equipment to help prolong its service life. We are proud to offer our clients the latest in cutting edge technology and fabrication methods. Our innovative solutions allow us to enhance project schedules and system quality. At ColonialWebb, you’ll find that we genuinely care about the safety of our team members and our customers. Safety is priority number one. It isn’t the “flavor of the month” or forced compliance, it’s ingrained in our culture and is our most important company value. Commitment to safety starts at the top. Through our Safety Resolution, our executive team promises their unwavering commitment and reaffirms that safety is ColonialWebb’s number one priority. You can see it every day at our jobsites and offices, in our trucks, meetings, and most importantly in our actions. ColonialWebb believes that safety is the responsibility of everyone and is integral to our work ethic. Our safety culture depends on our team members caring about the welfare of themselves and all those around them, and acting accordingly. The safe way is the only way! Our company started in 1972. 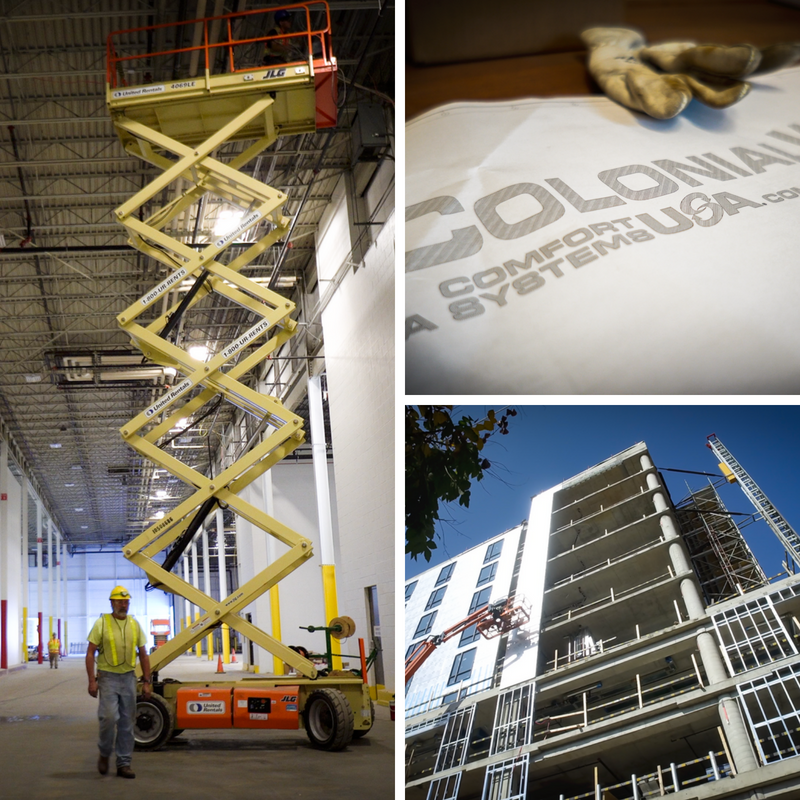 Colonial Mechanical and Webb Technologies, with similar operating philosophies and a single dream opened their doors to the public with the intention of becoming a regional provider of building systems installation and maintenance. Today with eight operating locations and nearly 1,000 team members, our company and history continue to grow and evolve as we embrace our future. We remain committed to delighting clients, fulfilling employees, and providing quality work. Our tremendous success is a direct result of the great people that work here, and by attracting high-quality companies that depend on us to be their trusted advisor. As part of Comfort Systems USA, we are able to provide solutions across the country. We are prepared to build, service or retrofit any mechanical, HVAC or electrical system. In the future, we'll remain focused on delivering innovative and energy efficient solutions with safety always being our number one priority. Having the courage to truly care about our customers, employees, and vendors is key to shaping relationships. It's critical to our company's success, and will always guide our commitments. As we have been in the past, we’ll always be that partner you can count on! ColonialWebb is committed to not only serving our customers, but also serving our community. Below are some of our most valued partners in ColonialWebb's community service efforts. With our long history of quality and innovation comes a long list of associations with other industry-supporting companies and groups. ColonialWebb is a long standing member of many professional and trade associations allowing us to keep up on the latest technologies and trends. We are continually connecting, partnering and learning in order to deliver you the best. Want to learn more about ColonialWebb? Please fill out the form below and someone from our team will get back to your shortly.